Lucas Pozzo-Miller completed his undergraduate studies in Biology (M.Sc., 1986) and earned his graduate degree in Neurobiology from the Universidad Nacional de CÃ³rdoba, Argentina (Ph.D., 1989). He trained as postdoctoral fellow at Case Western Reserve University, Cleveland OH, with Dr. Dennis Landis (1990-1992), and at the former Roche Institute of Molecular Biology, Nutley NJ, with Dr. John Connor (1992-1995). He performed research at the Marine Biological Laboratory, Woods Hole MA, with Dr. Rodolfo LlinÃ¡s (1994 Grass Foundation Fellow, and 1995 Lakian Foundation Fellow). He held a Senior Staff Fellow position at the National Institutes of Health, Bethesda MD, in the laboratory of Dr. Thomas Reese (1995-1998), and joined the faculty of the Department of Neurobiology at The University of Alabama at Birmingham in 1998. 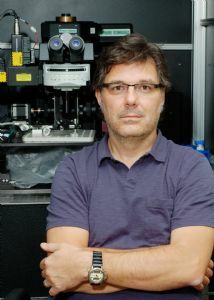 He is presently Professor of Neurobiology.